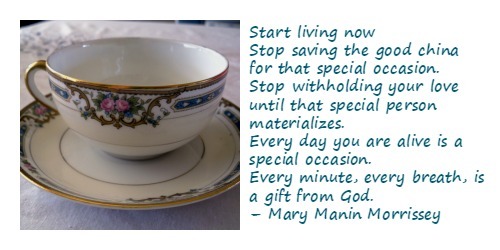 Today I got thinking about hoarding ‘good’ things and no using them for fear that they’ll get over. I know I used to do that with stationery – something that I treasured. I’ve known people to do that with china and with linen, besides clothes and shoes. We wait to use things for a ‘special’ occasions. The problem that when that occasion final arrives, the linen is soiled, the china cups have fine lines that make them look bad and the clothes and shoes are out of fashion or don’t fit you any more! The sad (good?) news is that we have only one life to live – so let’s live well! I’m not inviting you to be extravagant – but rather to enjoy everything you have and own while there’s still time.
. I will be reviewing it here shortly. I also enjoyed reading Spirit Recovery Medicine Bag, the review of which I was happy to share on Vidya Sury’s blog. I also enjoyed writing reviews for A Good Year For The Roses and Love, Lies and Lemon Cake on my other blog, From 7Eight. There’ll be plenty of book reviews coming up on that blog every day! Important: Last year, I wrote a post for World Suicide Prevention Day here, and also on Write Tribe where I invited readers to write posts on their blogs and link in. This year, we’ll be doing the same on 10th September. The theme for this year is : Suicide Prevention: One World. Do sign up too for the Facebook event for this. That’s all for today. Remember to link your Sunday post here and have a wonderful week! Yup! Live the moment. Never ever give any minute back until there is nothing left of it.